I read Ishiguro's fantabulously gorgeous Never Let Me Go during a brief and ill-advised stint in grad school, and it was one of the few assigned books I actually enjoyed. So when I heard he was publishing a new book this month, I made sure I was at the top of the library hold list. 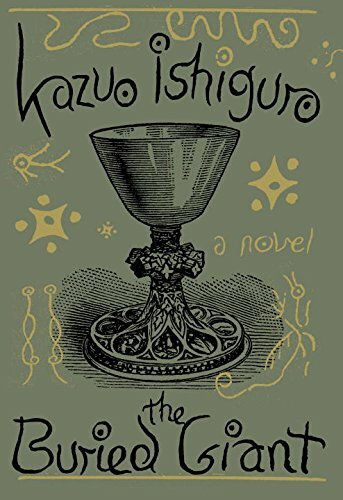 Even though he could skate by on his looks, Ishiguro delivers another lush, lyrical novel, this time set in a strange, parallel-universe Britain in the Middle Ages (though thanks to some specific linguistic choices, the story has the timeless feel of a fable). Axl and Beatrice, an elderly couple, set out from their village to visit their son. Though it should be a straightforward journey, they find their way fraught with confusion and peril. The presence of a she-dragon in the region casts a mist over everyone's memories, making it a constant struggle for the couple to remember basic information such as how they met and why their son went away. Axl and Beatrice are dear despite their befuddlement. Right away I liked their tender way of speaking to each other; even as it grew repetitive, it never grated. I hoped for a good ending for them, although I wasn't sure they would get one—the occasional flashes of memory they do regain are ominous, full of old hurts and grievances, the emotions of which are more vivid than the facts. It seems unlikely they will come to their son's village and find him happily awaiting them. I've seen some reviews that take issue with the opacity of the novel, and it's true that Ishiguro obscures almost as much from the reader as he does from his characters. Much is left unsaid and unexplained. But his prose is so fracking gorgeous, I was hard pressed to notice—much less be bothered by—anything else. His writing is as plush as an old armchair. I want to sink in and never find my way back out. It may not be as clearly realized as Never Let Me Go, but The Buried Giant is still some nose-scrunchingly good literary fiction. I was * this close * to rubbing my face on the pages. TagsAcross the Pond, Challenge Yourself, I Love My Family But..., Journey to the Past, Mind Games, Sumptuously Gorgeous Prose, Unreliable Memory, War! What is it Good For?